This might just be the trashiest guacamole you have ever seen? I CARAMELIZED THE PINEAPPLE IN BACON GREASE. That required shouting. The all caps life. It’s that good. Ugh. I’m quite in love with it. Really, I’ve reached the point where I’m not above caramelizing anything that can be caramelized in bacon grease. It has vastly improved my mood, I swear. Keep a jar in the fridge and good things will happen. Write that down, comes from grandma. Veggie friends, before you disown me? Leave out the bacon and try it with just the pineapple (caramelized in butter or coconut oil) and goat cheese. I know this is also one of the greatest things of life because I might have used all my bacon and made this for a third time minus the pork. In fact, it could have been my lunch. I didn’t think I’d like this guacamole. I didn’t think I’d like it at ALL. My guac preferences are usually quite simple – give me lots of lime, salt, cilantro, maybe some diced onion if I’m feeling it, same goes for the jalapeno and if we’re really talking out of the box, tomatoes. My favorite recipe is in Seriously Delish but if I’m being real, I even make it more pure than that recipe these days. This mango guacamole was about as wild as I’d get. But then. You know I have this thang going on with pineapple? And I always have a thing going on with bacon. Even more of a thing these days with goat cheese. And at first I was just going to do pineapple and bacon but then I had all the cheese of the goat in my fridge and I figured it would be the perfect complement to the sweet pineapple and smoky bacon and boy. Was I ever right. My mom was also over the day that I made this. Let it be known that this is SO not her cup of tea. Yes, she loves guacamole but she does not like “weird” things. She prefers… the classics. Let’s leave it at that. So, I had to tell her to try it because bite after bite I was like “OMG” and then I’d take another bite and be all “how is this so good? !” and then I finished the bag of chips before I knew it and had to GO BUY a new bag because I could not deal with the pile of bacon pineapple guac on my table. AND. She loved it too. Like really loved it. Like we loved it so much that there was a tiny bit left and we saved it, which is huge for guacamole, you know, and pulled it out two days later to eat for a snack. And then made more. And more again. 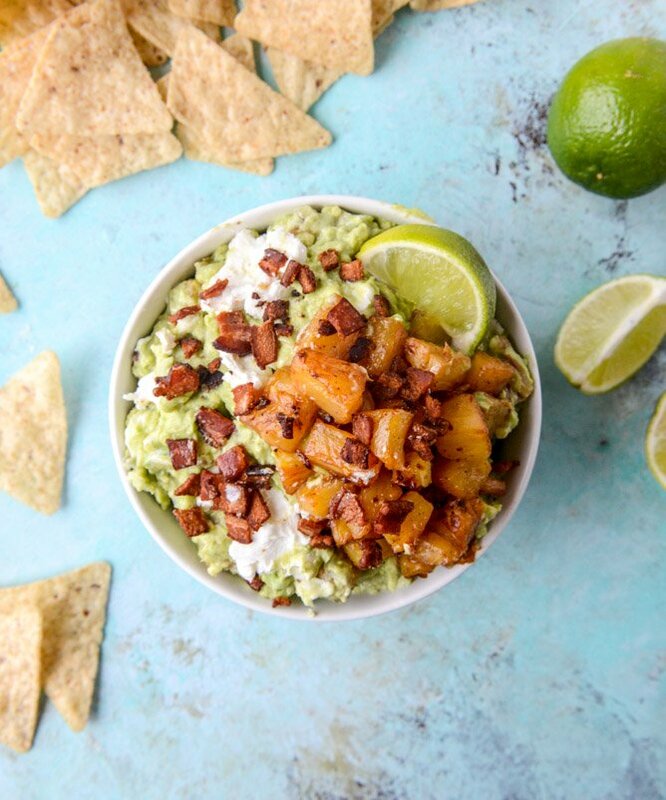 This probably isn’t the guac that you’d want to serve with tacos or enchiladas (unless you’ve having me over for dinner), but as a party dip? YES. As lunch? Double yes. Make it happen! Heat a large skillet over medium-low heat and add the bacon. Cook until totally crispy and the fat is rendered, stirring occasionally. Remove the bacon with a slotted spoon and place it on a paper towel to drain the grease. Increase the heat under the skillet to medium and add the pineapple cubes, tossing to coat. Cook until the pineapple gets golden and caramely, about 8 to 10 minutes, flipping once or twice to caramelize all sides. Remove and let the pineapple cool slightly. In a large bowl, mash together the avocado, jalapeno, onion, cilantro, the juice of 2 limes, salt and pepper. Taste and season additionally if desired. Stir in almost all of the pineapple and bacon, then stir in the goat cheese. 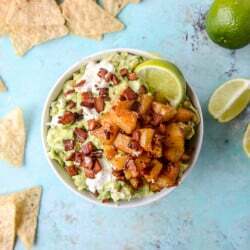 Scoop the guac into a bowl to serve and top with the remaining pineapple and bacon for garnish. Serve immediately. 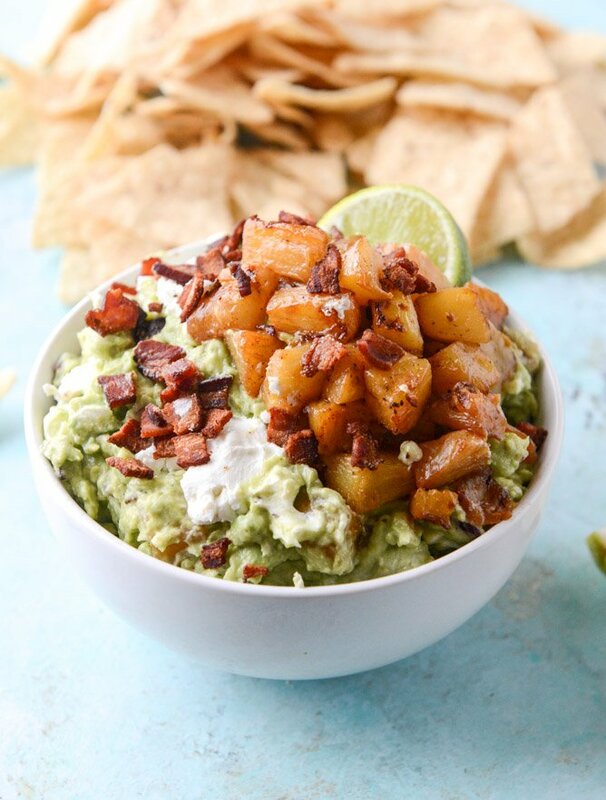 I saw this when you first posted it, but didn’t consider it a real possibility until today… because there are ripe avocados in my kitchen and fresh chopped pineapple and a huge container of goat cheese and the bacon is in the freezer, but we all know how quickly and easily bacon can be defrosted… gah. I may have to stop for jalapenos on the way home. So I just made this guac tonight as an appetizer. We ended up ditching the main course. My life is now complete! Was everything you promised! Made it for a cinco de Mayo party at foodie friend’s house— it was the only dip that was GONE! Getting ready to make again for girls’ happy hour by the pool.YUM!